Farmers Market Makes Way Around New Britain – The Community Chest of New Britain and Berlin identifies and invests resources in programs that benefit the New Britain and Berlin communities. 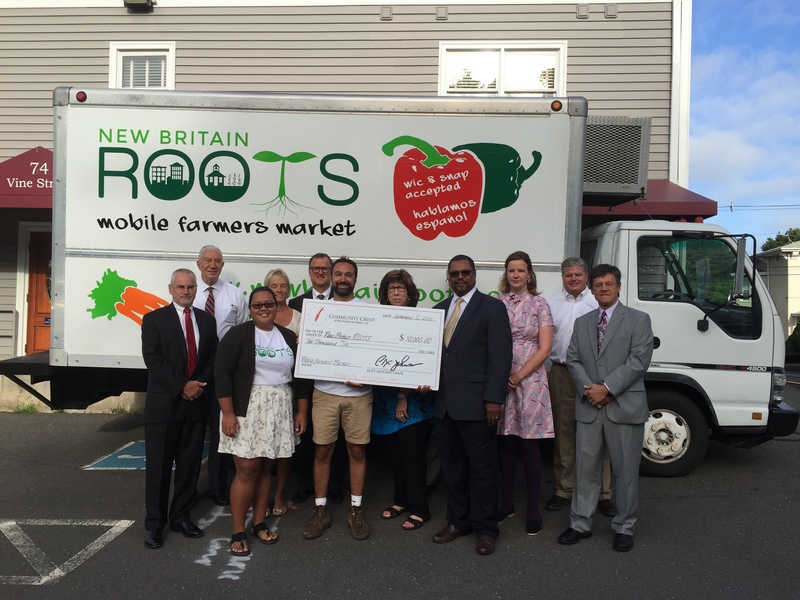 (Published by New Britain ROOTS, August 23, 2016) New Britain ROOTS, a youth engaged nonprofit, aims to fight food insecurity by making healthy food accessible and affordable. ROOTS works collaboratively with New Britain schools to provide educational programs on sustainable agriculture, food justice, and healthy eating practices. ROOTS also works with Urth Farms, a local urban farm to connect youth to organic food production. The ROOTS Mobile Farmers Market makes stops in neighborhoods that have limited access to fresh fruits and vegetables. New Britain often ranks high in the state for food insecure communities; a problem that may contribute to chronic health problems such as obesity, heart disease, and diabetes. The market pairs with organizations that seek to improve their client’s health and wellness. Those going for an appointment at the Community Health Center can also stop at the market, or a parent picking up their child from school can buy fresh produce for dinner. The market runs a SNAP (formerly Food Stamps) incentive that allows participants to Double their SNAP dollars. This allows participants not only the ability to stretch their benefits throughout the month, but the ability to buy more healthy food. Executive Director of ROOTS Joey Listro stated, “We want to reach those residents with few mobility options who have difficulty purchasing locally grown, seasonal fruits and vegetables. We also want to increase the amount of food being produced and consumed closer to home, keeping more money and work in our local economy.” The market supports local farmers by having Connecticut Grown produce on the truck, and one of its major partners is Urth Farms of New Britain. Selection of produce varies week to week, but customers can find tomatoes, corn, peppers, squash, kale, peaches, apples in addition to herbs and local honey. ROOTS partnered up with Opportunities Industrialization Center (OIC) and Human Resources Agency (HRA) to connect local High School students to real life work experience in community farming. For five weeks, students rotated working on Urth Farms and community and school gardens. Other students were able to work on the market gaining skills in customer service and marketing. ROOTS will continue to work with high school students through an after school program that will include use of the NBHS greenhouse and a farm entrepreneurship training.